The Schubert Ensemble have decided to bring their 35-year career to a close at the end of June 2018. Their fourth visit to ICC by this distinguished ensemble will be therefore sadly be their last. After 35 years at the top of their game, this will be the Schubert Ensemble’s final season. The group has performed in over 40 countries, has over 80 commissions to its name and has recorded over 30 highly acclaimed CDs. 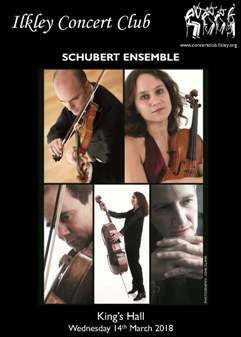 In 1998 the Schubert Ensemble’s contribution to musical life was recognised by the Royal Philharmonic Society when it presented the group with the Best Chamber Ensemble Award, for which it was shortlisted again in 2010. For their fourth and final appearance at ICC, the Schubert Ensemble bring Bruch’s Quintet, written for a group of amateur players in Liverpool, and filled with his luscious song-like melodies. Charlotte Bray’s quartet was written for the ensemble and inspired by a visit to Greenland: well received on its premiere earlier this year the three movements explore the different forms of ice – an ice-field, a calving glacier and an iceberg. The programme culminates with one of the masterpieces of the piano quintet repertoire – a mixture of Dvořák's expressive lyricism and his unique ability to distil the essence of Czech folk music. There was inevitably a valedictory note to the fifth visit of the Schubert Ensemble to Ilkley Concert Club, for this is the Ensemble’s final season after 35 years of music-making. The group continues to demonstrate the benefits of playing together – a mastery of ensemble and balance which comes from unanimity of focus and feeling. In particular the balance between piano and strings, so difficult to achieve, is exemplary, the piano line only emerging when necessary for the music. The concert began with Bruch’s G minor piano quintet, a piece written for amateur players, but one which readily fulfils Bruch’s desire to write music which is ‘pleasing and easily understood’. The energetic Scherzo particularly stood out, offset by its dreamy and lyrical Trio. This was wise programming as it was followed by the Züstande for piano quartet by the young British composer, Charlotte Bray, something far harder to digest. This was inspired by a visit to Greenland and depicts the different aspects of that icy environment. Icy tremolos and loud cracks in the strings dominated the short first movement. More lyrical lines, running from the bottom of the cello’s range to the highest notes of the violin challenged the players in the second movement but failed, for me, to describe an iceberg. A lively final movement with fractured rhythms followed, concluding with long grey chords. The applause which followed acknowledged the success of the Ensemble in their championing of such a complex work. In the second half we returned to the late-nineteenth century for a glowing performance of Dvorak’s A major piano quintet. His combination of wonderful tunes – the first recalling ‘Shall we gather at the river’ long before Dvorak had been to America – folk rhythms and classical form never fails to delight. The highlights were the Andante, in which the returns of the first theme seemed new minted, and the Scherzo, which combines Schubertian elegance with the vigour of a Czech furiant. The Schubert Ensemble gave a wonderfully subtle and engaging performance which swept the audience along – a memorable ending to a challenging concert. This charming work has attracted two recommendable recordings. 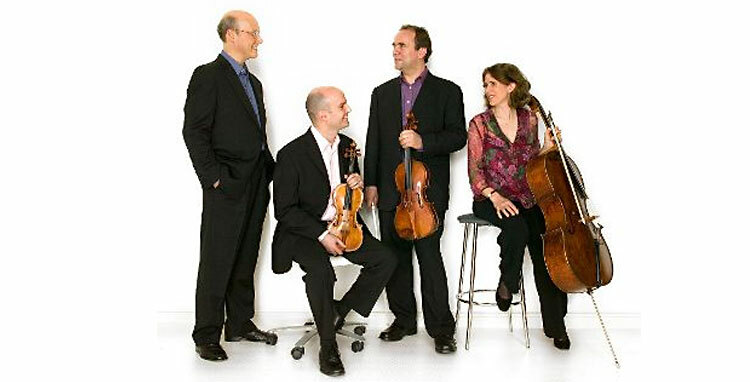 One, at full price from Hyperion CDA 68120, is performed by the Goldner Quartet with Piers Lane (piano). The coupling is Bruch’s String Quartet No.1 and Swedish Dances. My favourite is from CPO 999 451-2 at medium price, played by the Ensemble Ulf Hoelscher, and includes Bruch’s String Quintet and String Octet. Both CDs are very good, and the couplings may help a decision. There does not appear to be a commercial recording of this work. There are many superb recordings of this work, but my favourite is a new one by the Pavel Haas Quartet with Boris Giltburg (piano) on Supraphon SU 4195-2 (full price). They also play the String Quintet, Op.97. Equally recommendable is the version by tonight’s artists on Chandos CHAN 10719, coupled with the Piano Quartet No.2. Finally, a wonderful version in good, but older, stereo, has Clifford Curzon with the Vienna philharmonic Quartet on Eloquence 480 4715 (medium price), with Dvorak’s String Quartet Op.51.